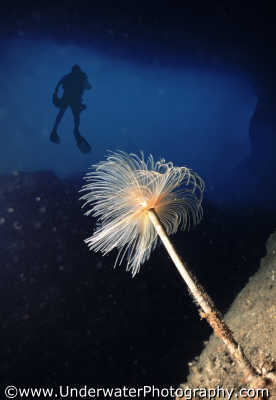 underwater Photo Course :: (6) Composition :: What is Composition? Expressed simply, composition is the art of consciously arranging the elements of your picture: lines, shapes, tones, and colors to their maximum effect. Composition is the one area that many aspiring photographers are uneasy about - perhaps because it does not deal in measurable quantities (unlike focus and exposure). Certainly, some people have no awareness of composition whatsoever. There's nothing mystical about the art of composition (it is an art, not a science). There are rules, but they're made to be broken. There is no right way or wrong way, just some ways are accepted as being better than others. The only thing you can definitively say about composition is that you can't ignore it. Regardless of how skilled you are in other departments your shots will lack impact without some consideration of it. The only difficult thing about composing a shot is that you must get it right at the time of shooting. You can edit an image later to make it smaller (either digitally or when printing it) but you can't make it bigger! You cannot avoid composition. If you take pictures, even on the level of just liking what you see, you are making (albeit unconscious) decisions about composition.